Traditional family run hotel in town centre. After arrival at Catania airport we drive (1 hour) to the ancient city of Enna, centrally situated high (1,000m/3,275 ft) on a great buttress of rock. We stay in the old town close to the cathedral and castle. Family run, converted ‘baronial’ house in the countryside near Gangi, with pool and characterful owner! We drive (30 minutes) to the village of Villadoro, set amongst open rolling hills in the centre of the island, and follow tracks, originally the routes of ancient drove roads, Carthaginian and Roman roads, with long views across the island to Mount Etna...until we come to the spectacular village of Gangi. We stay at a converted patrician villa in the valley below the village (8.5 miles, 5 hrs). We explore Gangi, its picturesque alleys, its piazzas and churches, and also visit the village of Sperlinga, with its troglodyte dwellings and castle (5 miles, 2.5 hrs). Remotely-situated chalet-style mountain hotel with good home cooking. We follow farm tracks then a section of ancient road, that includes a fine Roman bridge, leading to the village of Geraci Siculo, with its Saracen fountain and ruined Saracen castle. 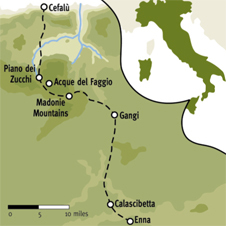 Continuing, we enter the Madonie National Park, noted for its geological formations, its birds and flowers, and follow paths through meadows of the Madonie Mountains to our hotel, on a remote hill-top site in the mountains (13.4 miles, 6.5 hrs). We cross a ridge and descend along an ancient grassy road, through woods, past a wildlife reserve, with fallow deer and wild boar, and finally down through beech forest before returning to our hill-top hotel (8.5 miles, 4hrs). Forest and farm tracks lead down to the to the village of Isnello, with its castle and fine medieval buildings. We then follow ancient tracks up to a sanctuary church with views, and continue down along the pilgrim route through increasingly sub-tropical vegetation, olive and lemon groves, towards Cefalù, where our hotel is a few metres from a beach (15 miles, 8.5 hrs). We follow paths up, through woods and scrub, on to the massive buttress of rock behind Cefalù - to visit its Greek and Roman sites, and enjoy a panorama of the town and coast. Descending we explore Cefalù, its harbour, picturesque streets and alleys and not least its outstanding cathedral dating from 1131, with impressive 12th century Byzantine mosaics (4 hours). In the afternoon we drive (1 hr) to the cathedral of Monreale, the great masterpiece of medieval architecture, still preserved almost intact after eight centuries. We visit the cathedral with its superb Byzantine mosaics and fine cloister. Alternatively, stay behind to swim, relax or further explore this delightful place on your own. We return to Catania airport (2.5 hours). If you would like an extension booking at either end of your trip please indicate this during the booking process and we will contact you with pricing information. Drove roads, dirt roads, mule, mountain and rough animal paths across rolling hills and low mountains. The fitness level of this trip is Grade 3-4. Sicily’s interesting cuisine reflects the varied influences of invaders (Spanish, Arab, Greek) over the millenia. Its varied style is also characterised by the intense and pure flavour of local ingredients. Famous for its rich and brightly coloured puddings, those with a sweet tooth will not be disappointed. Sicily (with Puglia) is the largest producer of wine in Italy, and the wines are continually improving: excellent Rosso del Conte red and Nozze d’Oro white. There is also the well-known dessert wine Marsala. Do the hotels have WIFI, hair dryers, laundry facilities? throughout the year with occasional cloud and rain, and warm on the coast. It can be very cold in the mountains where we are at over 3,000ft. 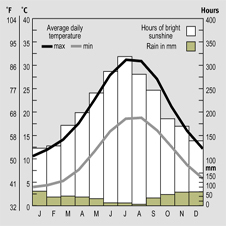 Otherwise, expect the spring to be warm, June–Sept to be hot and thereafter, cooler. October sometimes has storms. Bring layers and waterproofs whatever the season. This is an 8-day trip with walks offered on 6 days, plus sightseeing. The length of each day varies from 2.5 hours to a maximum of 7 hours walking. The fitness level of this trip is Grade 3-4 . The walking is reasonably challenging. We cross high grassy uplands between 3,500 and 5,000 ft before descending to sub-tropical vegetation on the coast. There are rolling hills, scrub and grassy meadows with rocky outcrops and fairly dramatic mountain scenery. The paths are mostly well-made farm and mule tracks but at times we follow small paths that can quickly become overgrown by the mountain broom and holly, both rather prickly shrub! For this reason we recommend you allow for the option of walking these parts with protective clothing (eg, long trousers/long sleeved shirt). There are no vertiginous walks. own expense. The transfer to the airport at the end of the trip will also be timed according to the recommended flight and we cannot offer transfers at alternative times. Please check with the Reservations Team before making independent arrangements. You are of course welcome to meet the group at the first hotel. Sicilian cuisine is one of contrasts: simple peasant cooking with the richer, more exotic styles of the invading civilisations. Its varied style is also characterised by the intense and pure flavour of the local ingredients. The mild winter climate and long summers mean that the fruit and vegetables are less seasonal than in northern Italy. Aubergines, artichokes and peppers are often roasted over charcoal fires and sprinkled with garlic, olive oil and chopped parsley. infamous tomato sauce and sweet and sour flavours. Fish is one of the glories of Sicilian cooking, prepared in every possible way including exotic fish stews and soups. We will try a selection of local wines, notably the red Corvo and the well-known dessert wine Marsala, as well as some of the award- winning ‘new wines,’ such as Nero d’Avola. There is no need to dress up on this trip. Dress is casual throughout. Three out of five have WIFI and hairdryers. All but the Park Hotel offer laundry service. The destination airport for this trip is Catania. There will be a set meeting time at Catania airport for the transfer to the first hotel; a set time for the return transfer to the airport at the end of the trip; and a 'recommended flight' to connect with the airport transfers. Booking the recommended flight - which we strongly encourage - guarantees transfers to and from the airport, irrespective of flight schedule changes or delays. For clients not on the 'recommended flight' we cannot guarantee a transfer from the airport should you be delayed for any reason in meeting the group at the specified place and time. In this instance you will have to make your own way to the first hotel, at your own expense. The transfer to the airport at the end of the trip will also be timed according to the recommended flight and we cannot offer transfers at alternative times. Please check with the Reservations Team before making independent arrangements. You are of course welcome to meet the group at the first hotel. Please indicate your intention during the booking procedure.